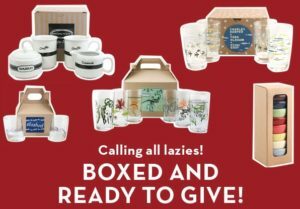 We got an email today from Fishs Eddy, one of our newer suppliers, recommending their gift boxed sets of products for lazy shoppers. At this time of year, I think the appeal should not be to lazy shoppers, but to busy ones. We want to make it as easy as possible for last-minute customers to get great gifts from our shops. Gifts sets like the ones Fishs Eddy is recommending are one way to do this. Some of the companies you buy from may offer pre-made sets, and if you have some of these in stock be sure to stack them out for easy shopping. Several of our bath and body product suppliers make gift sets at a sale price that makes them particularly attractive. Signage indicating this special offer is essential. You can also consider featuring them in your customer email blasts during the holiday season. It’s easy to put together gift sets on your own. We’re not talking elaborate gift baskets — although our shop does do these occasionally as corporate gifts — but rather suggestions of items that make great sets when sold together. You might want to cross-merchandise, pairing a cheese knife with a cutting board, or tie like items such as four different colors of candles together. Customers also sometimes appreciate the ease of buying a pre-wrapped item. Consider taking a few of your hottest items for the season and display a stack of them already wrapped in holiday paper. Clearly label (with a removable tag) what is in the box, and include whatever code and pricing you’ll need to ring up the gift. By creating a display with a large number of the same item, you demonstrate your confidence in its popularity. Include some that are not gift wrapped in your display to test your customers’ preference. Don’t forget to promote your gift cards during the season. 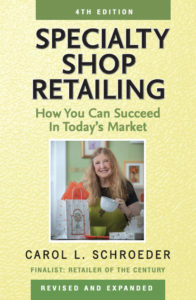 They make an easy gift for anyone who would enjoy your shop, and will bring customers in after the holidays.